Do You Have A Wet, Leaky Basement? Your home is your most valuable asset… and each home and basement is different. Basement leaks not only make life miserable, they may cause damage to contents, produce mold and result in expensive repairs to your structure. Your foundation may be fieldstone, cement, concrete block or cement walls. All experts agree that the most common water entry points are, the floor wall join, wall cracks, floor cracks, and down the walls, creating wet basement problems. Unfortunately, a lot of basement foundation walls are not built with proper drainage systems on the inside or out. In addition to that, rarely is the outside of the foundation waterproofed properly. As a result, if the concrete cracks, you get a leaky basement. If you try to waterproof your foundation while the home is being built, usually they will put a waterproofing barrier solution on the outside of the walls and they might install an exterior French drain system. Everyone thinks that is the most effective solution to basement waterproofing, but over time, that has been proven to be inaccurate because the solution applied to the home will eventually wear off and fail and the French drain system, which is perforated pipe, will eventually clog and fail. This will lead to having to dig up the entire perimeter of your home and replace the entire piping system. Not only is this costly, it is messy and will require you to redo all of your landscaping, once the system is reinstalled, costing even more money. With our type of interior drainage system, called Water Trek, the patented non-clogging, self-washing, lifetime guaranteed system; you’ll forget we were even there. Our system is different than all other interior drainage systems, because we only have to dig down into your basement floor about 8 inches, due to our patented Water Trek system. Our drainage canal sets on the floor, not next to the footer, and drains into the Water Grabber sump pump, then gets sent outside. With most interior drainage company’s systems, they have to dig down almost 20 inches into the ground. That’s because they use perforated pipe, which the diameter is very large and they set their drainage next to the footer, not on top, because of the diameter, it can’t go on top of the footer. The reason this is more harmful, is that it can undermine a foundation’s strength. Our ability to only dig down 8 inches, leaves the foundation’s integrity in tact! That’s a very important fact about interior waterproofing and that is why our system was invented! So, since we don’t have to remove as much ground, we don’t have to make as much mess and we don’t have to take as much time. We will be in and out of your home within one week, unless you have other projects being done at the same time, which may extend your project length. Your basement will look clean and undisturbedwhen we leave, but it will be dry! Getting a waterproofing system and getting your house dry is better for your home, and your family’s health! Of course, if you take care of this potentially dangerous problem quickly, the cost will be kept lower because it will help stop mold from growing and adding a mold project to the waterproofing project. 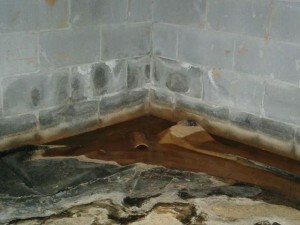 Cracks in basement foundations can be found in almost every home. They can be in corners, straight walls or corners of windows, as well as pour lines and in holes for service line, or tie rods. Since the soil on which houses are built varies, not every foundation settles the same, which can cause foundation cracks in your basement. It is important to repair all cracks as soon as they are discovered to avoid more extensive damage. The water infiltration from these cracks must be fixed permanently. Basement walls should seal out a moderate amount of water, but few will withstand a great deal of water pressure. Because of the eventual build-up of water pressure against the foundation, even the smallest leak can lead to a flooded basement, potentially costing thousands of dollars in home repairs and mold remediation work. Our company’s dedicated Dealer, Basement Technologies research and development team, has created innovative basement waterproofing solutions such as Water Grabber, Technicrack and the Water Trek Aqua Route, to keep your basement dry, as efficiently as possible. No matter what the basement problem, from basement leaks, to sump pump installation, and flooding repair, Integra-Clean & Dry has a solution. High humidity levels can cause moisture in a basement. The problem can be solved with the help of one of our heavy duty portal room dehumidifiers or by the installation of a dehumidifier system. At Integra-Clean & Dry we only use the best dehumidifiers in the market. The soil around the house is either naturally damp due to environmental factors such as high rains, humidity levels higher than the normal or maybe due to improper water drainage around the area. In such an instance, it is advisable to use a basement waterproofing system. Basement Waterproofing services to all of Northeastern PA.